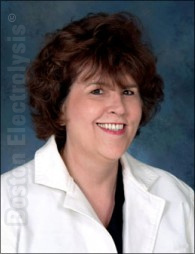 Hi, I'm a TG woman and just love Boston Electrolysis ®. I've had four other electrologists. The last one here in Arizona made me feel like an ATM machine. I would go in for an hour or two and be done exactly an hour or two later, not counting the time she was talking on the phone or changing the TV channels. Also the electrologists there were uneducated and not licensed. I didn't like that at all ! So I looked around the internet and found Boston Electrolysis ®. Kimberly is fully licensed and has had 33 years treating TG women and being TG herself made me feel comfortable. Her computerized equipment for hair removal is the best and she explained to me how it works and that it will only zap the hair only when the probe is inserted properly so not to damage the skin and maximize killing the hair follicle. Knowing that made me feel good knowing I was getting the best possible treatment for my money. That is great for me and other TG woman because we spend allot of time at the electrologists office. I was diagnosed with polycystic ovaries at age 24. This is a disease of the endocrine system. In my case the disease manifested itself in the most obvious way; I became a hair factory. My face, neck, arms and legs started to resemble a man’s if not a monkey. Of course I was horrified. I talked to my doctor about it. I was prescribed a cocktail of medicines – estrogen, a diuretic, and insulin to regulate my system. I didn’t see any dramatic results, and I wanted dramatic results because this was my face, after all. I tired of bleaching my hair, trimming my hair, waxing, tweezing, using a depilatory, etc. so I decided to get laser treatment on my face. I went in for my first treatment and I was excited. Finally, I was going to look like every other woman in her twenties. I didn’t want to be supermodel beautiful – just touchable. The dermatologist that I went to told me I would feel some pain when the laser was used and it would take a few days for my skin to flake off and return to a normal, healthy state. I thought a few days, no problem. The doctor applied this cold gel to my face, put some goggles on me and went to work. There was some pain, but it was tolerable. Anything was tolerable to get rid of the hair. I left the office feeling optimistic but I did have a tinge of anxiety because my face was emitting a strange odor. I went home and continued to get more and more nervous because my face smelled as though the flesh was being burned off. My face had that putrid smell for about a week. Once the skin "flaked" off I was dismayed to see those ugly, nasty, pesky hairs. The laser didn’t work on the first try and there was no way I was going to return to be burned again. I decided a few months later to try electrolysis. At this point I was game for anything. I made an appointment with an electrologist in the area. I went to my first appointment. I was told electrolysis was a lengthy process. I decided to try this avenue to get rid of my hair problem. Week after week I laid down on the table and had needles stuck in my follicles. The insertion of the needle was painful and I could hear a sizzling noise when the current was released to travel through the needle into my face. I decided to take a break for a while to let my skin heal and to assess the results. There were some bare patches few and far between in the forest of hairs so I knew electrolysis could do the trick but I couldn’t go back because my skin was so tender and I had scabs after each treatment. I was worried about scarring. I decided to take matters into my own hands, and boy did I ever. I tweezed and tweezed. I tweezed every possible hair on my face, but I just made my hair problem worse. The hair was getting denser, thicker and darker. A friend suggested trying her electrologist, Kimberly Williams. I trusted her judgment but I was filled with anxiety and embarrassment. I made an appointment and went to the office. I don’t remember anything up until the needle was inserted and removed. I felt little to no pain! I let out my breath and Kimberly said, “That wasn’t so bad, was it?” And I thought, no it wasn’t. I can do this. I have been receiving treatment for almost two years with Kimberly Williams. It has been a long two years, but every week the hair thins out a little more, the hairs become finer, and are lightening in color. I told Kimberly that I had polycystic ovary syndrome about a year ago and she urged me to see my doctor and ask to put back on a medicine treatment that would help my body fight off the hair. I took her advice and went back to the doctor. After being on the medicines for a little over a month my hair slowed down and more and more hair was dying off. Having polycystic ovary syndrome isn’t easy. It is actually quite depressing because up until finding someone who is capable of treating and killing hairs you try and try to find a solution to have a “normal” face. Having electrolysis by someone who knows what he or she is doing makes all the difference in the world. I now know my hair will eventually go away. I just wish I had found Kimberly four years ago, and then I would be hair free today. I really do appreciate all the work and the improvement I have experienced! I have never written a testimonial for any product or service before, but I just had to share my electrolysis experience! After years of dealing with embarrassing facial hair, I was skeptical about electrolysis. I had tried everything else: bleaching, plucking, depilatories, home electrolysis devices and expensive laser treatments. All without success. Not only was I self-conscious about the hair, but I also had frequent breakouts from my attempts to remove it and resultant in-grown hairs. I was considering trying laser hair removal again to see if the technology had improved. Searching the internet I read numerous studies that concluded that laser hair removal was not permanent. The articles all cited electrolysis as the only permanent method. Finally, I made an appointment for a consulation at the Boston School of Electrolysis. Kimberly, the owner, was very encouraging about my case. Her certification and years of experience impressed me so I decided to give it a try. Electrolysis is not an overnight treatment. But going regularly, I have seen the number of hairs decrease steadily. The remaining hairs are finer and inconspicuous. My treatments now are weeks apart and take just a few minutes. Best of all, I never worry about others noticing my facial hair anymore. What a relief not to even give it a thought for weeks at a time! Kimberly's treatment has been very comfortable and skillful. I wish I had done this years ago! The decision to seek treatment at the Boston School of Electrolysis is the best investment I have ever made in myself. Thank you Kimberly! About 5 years ago, I consulted with a plastic surgeon regarding acne scar removal. I also inquired about another service they offered, laser hair removal. Luckily, they were honest and told me that this procedure was cosmetic and that the only permanent hair removal available is via electrolysis, which they did not provide. It was not until 2004, however, that I followed up on this matter. I have had a persistent facial hair problem since my late teens, nearly 20 years. Primary affected areas involve my chin (including underneath my jaw line), upper lip and more recently, my side burns (down to my jaw line). Though I have 3 sisters, I am the only female in my family with this problem. It started with a few visible hairs plucked occasionally and grew to an obsessive daily ritual (sometimes twice) that could exceed one hour. As a result, I had a purplish-red irritation, or "staining" on my chin area that makeup could not adequately cover. And, after all this, budding black hairs remained visible, but just out of the tweezer’s reach. I was making matters worse. The hairs only multiplied and became thicker and stronger. Secondary conditions of dry flaky skin patches, acne and scabbing had also developed in these areas. What finally motivated me to seek help with this problem was the nuisance factor. I have 4 children ranging from toddler to teen in 4 different schools, a husband, pets, a home, a job and what seems an endless backlog of priorities. I could no longer afford the time investment required to keep up with the plucking and shaving. Plus, my husband would wince at the site of me with my face and tweezers in the mirror and even more so afterward due to the redness and sometimes oozing matter. He encouraged me to get this taken care of, but I thought I didn’t have the time and didn't want to "waste" money on vanity. I see it differently now. I went to Kimberly Williams of the Boston School of Electrolysis in early February. I was impressed with our initial telephone conversation, followed by a well-presented and informative consultation. I came away with confidence in the procedure that has only grown throughout treatment. Originally my appointments ranged 1 to 2 hours; in two months, they've reduced to approximately one-half hour twice per week and soon will be once per week. I am pleased with the results. The health and appearance of my skin has only improved and of course, the hairs are vanishing. The ill-reputed discomfort involved is overrated. I find electrolysis by Kim completely tolerable and well worth it. As with all things in life, this is a process and you get out of it what you put into it. There is no instant gratification, except knowing you are on a path to relief. I only wish I’d done this sooner. My time is now better vested. I appreciate and value your help!